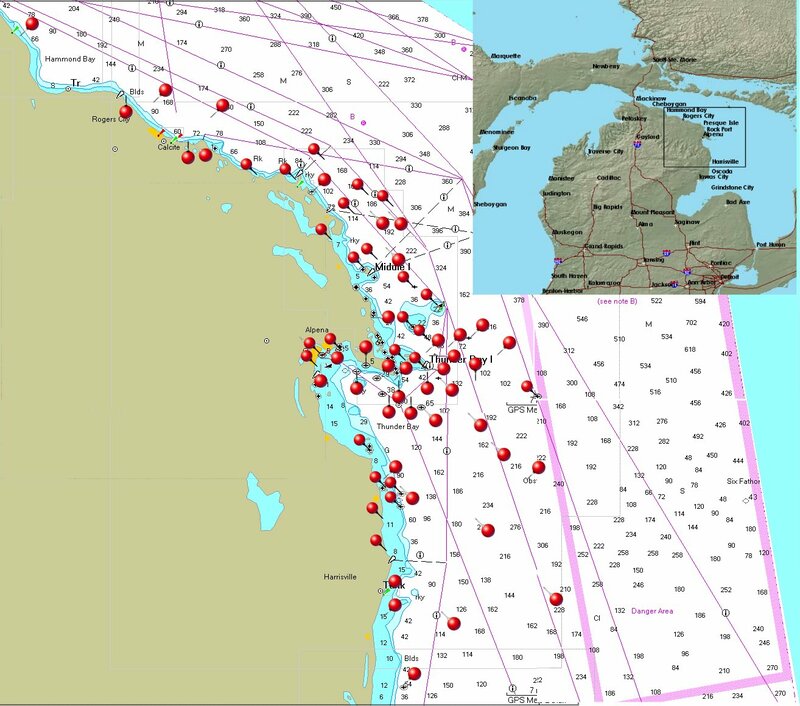 The Thunder Bay National Marine Sanctuary encompasses 448 square miles of northwest Lake Huron, off the northeast coast of Michigan's Lower Peninsula most centrally located on the City of Alpena. The landward boundary of the sanctuary is marked by the northern and southern limits of Alpena County, and the sanctuary extends east from the lakeshore to longitude 83 degrees west. Alpena is 100 miles south of the Mackinaw Bridge, or approximately 250 north of Suburban Detroit along US-23. Highway M-65 is an alternate north/south route that intersects M-32 14 miles to Alpena's west. Interstate I-75 passes 80 miles to the west through the City of Gaylord. Click on our Road Maps Button for more complete directions.